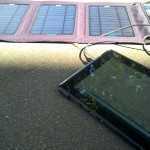 From now until an estimated 1600 (based on yesterdays sun power curve) I should be able to collect around 10Wh of energy in my power pack which will result in about an 8 Wh transfer to my PC, an HP Stream 8 tablet, which will run it for 2 hours maximum., assuming I keep the panel trained on the sun and that the sky stays clear which it probably won’t. This is effectively the starting-point of the season. 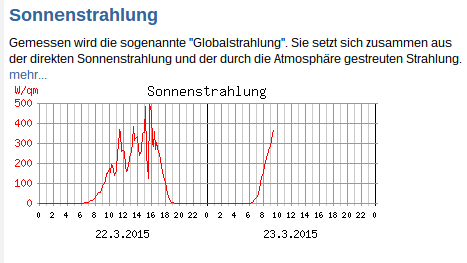 As the weeks go on the power curve will widen and heighten. The area under the curve could double from here until midsummer which means a potential 4 hours of tablet computing per day from a single panel. Today, to boost that weak power source, I’ve got a plan. Bring out the Big Boy! 24 W panel works in ‘low sun’ with Kalhuohfummi. This 25W panel is perfect for these conditions. 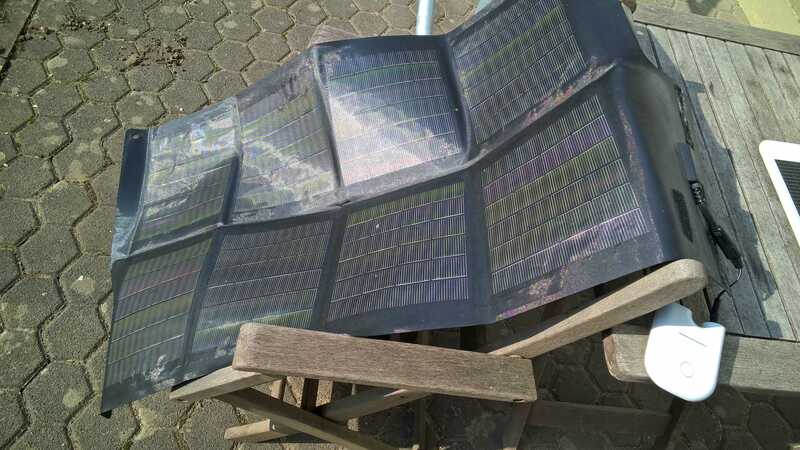 It was damn expensive (bought for over $400 in 2007 for the original Solar UMPC tour) but you can get (less rugged) solid foldable panels for much less than this now. The charging rate jumped 4X which means that I’m good for an easy 4 hours tablet PC usage per day. [Note: Be careful in full mid-summer sunlight as the 24 W output would be too much for the Changers solar power pack.] 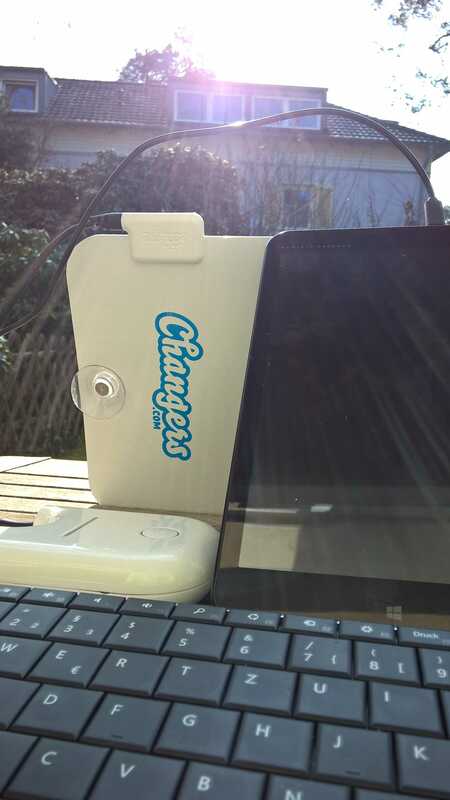 As I write this the sun has passed behind a tree but I’m still getting 1-2 W charging. Microsoft Wedge Bluetooth keyboard with fold-able cover that can be used as a stand. 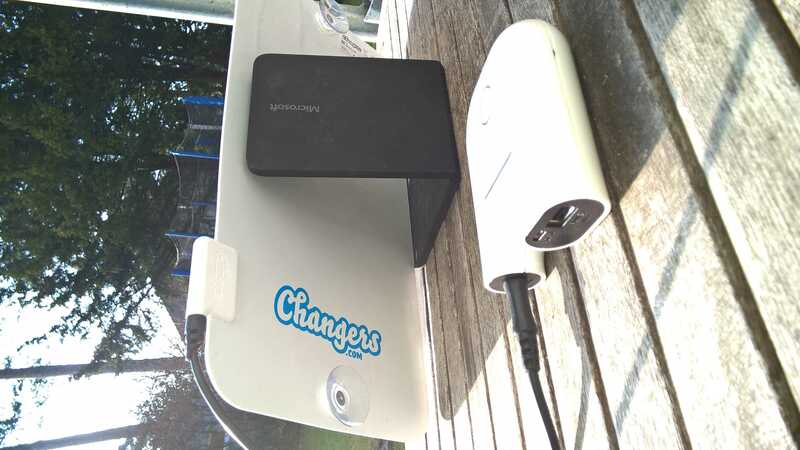 Changers Kalhuohfummi solar-ready power pack. 25W Sunlinq foldable solar panel. All equipment bought and owned. 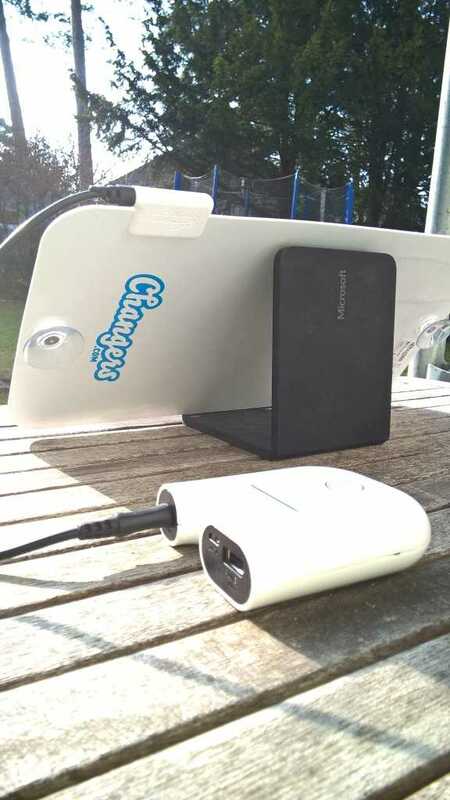 Output from the Kalhuohfummi power pack is limited to 1 Amp so the HP Stream 8 switches to slow-charge mode and requires 8-12 hours to charge its 14 Wh battery. Perform a ‘shutdown’ to stop the Stream 8 going into ‘InstantGo’ mode. Charging will be faster. 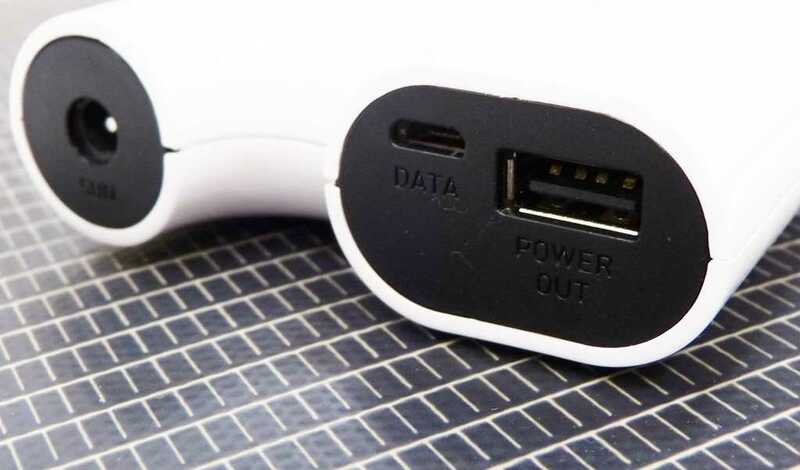 If you’re charging while in-use, the Stream 8 will just about hold its charge. I’ve been looking at the eJaguar E-60 recently. It looks like it has the same solar-friendly circuitry as Kalhuohfummi. If so, it might be a better partner for the 25 W panel and a potential laptop power source. E.g. ASUS X205 which is incredibly efficient and low-cost. Or the HP Stream 11 X360 with Datapass 3G. The ultimate alternative would be Diamond Creek. 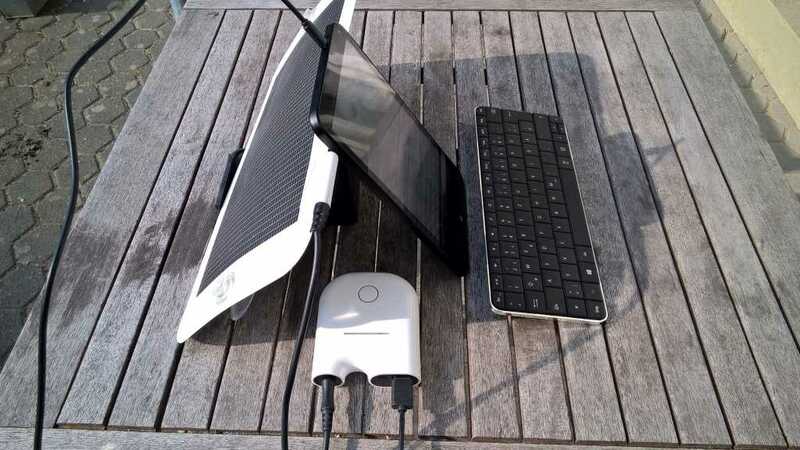 I’m going to write to Intel to see if they’ll let me test one because although it can be a huge advantage to separate the sun from the equipment being used, there are times when the external battery wastes too much energy. As always, your tips are welcome. Please share!